Graves Motorsports 2015-2019 Yamaha R1 Cat Eliminator Titanium Exhaust System with Titanium 265mm silencer. GMS Exhaust systems are designed for the elite rider seeking top of the line performance, fit, finish and value. 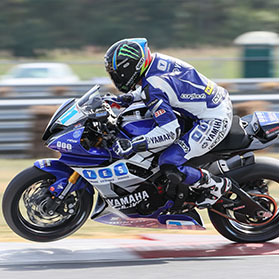 This R1 exhaust system was developed using the same technology that has powered Monster Energy Graves Yamaha riders to 8 Moto America / AMA Superbike championships along with numerous 600cc titles. This product is intended for closed course competition use only. Use of this product for any other purpose is strictly prohibited. We use the same 1.00 MM thick wall high heat grade Titanium tubing used on our Superbikes. This material is designed special for maximum durability and oxidation resistance up to 800*Celsius / 1472*Fahrenheit. It is designed to live at almost twice the temperature of normal Grade2 Titanium. The tubes are precision bent and cut with the latest equipment available. The tubing is then welded in fixtures designed so that repeat ability is second to none. It comes with a single Lambda receiver bung for on track data logging or Dyno tuning. The spring tabs are made from 4MM thick Titanium wire for long life. There is only system to get for any Yamaha. Got the Titanium Exhaust to flow better with the rear polished swing arm on the R1M, its not a perfect match but its two different types of metals. It looks amazing and sounds even better. Also installed the Flash tune with the graves map. The bike is 10 times better, its not so chocked up. I thought I was in 6th gear when I was actually in 5th.